Prof. Dr. Momcilo Babic is one of the most prominent serbian doctors. He was born in Peć (Kosovo and Metohija), he studied in Belgrade, where he graduated from the Faculty of Medicine, and received a master's degree in Moscow as a scholarship holder of the World Health Organization at the International Faculty of Health Care. He received his PhD in Belgrade at the Medical Faculty in 1986. He specialized in social medicine at the Faculty of Medicine and was selected as a scientific associate. He is a full-time professor of social medicine at the Faculty of Medicine, University of Belgrade since 2000. Prof. Dr. Momčilo Babić performed numerous professional and social duties. He was Director of the Sector for Development of the Clinical Center of Serbia, City Secretary of Health in the City Assembly of Belgrade, where he initiated the project "Belgrade - A Healthy City". 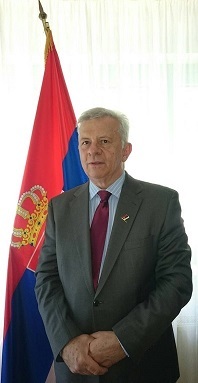 He successfully served as director of the hospital KBC "Bežanijska kosa" for ten years, was assistant to the Minister of Health of the Republic of Serbia, as well as director of the National Health Insurance Fund from 2013 until 2015. He was the President of the Council of the University of Belgrade. He spent more than two years in study visits, especially in Russia and the United States in relevant world institutions, including: Johns Hopkins University in Baltimore, Atlanta Center for Disease Control and Prevention, US National Health Institute (Maryland), George Town University in Washington, the Karolinska Institute - Stockholm, the London School of Hygiene and Tropical Medicine, the Semashko Institute in Moscow. He established a cooperation with the Rush University of Chicago, and for many years the doctors from the hospital he headed were sent there to specialization. He is the author of more than 250 scientific and professional papers published in foreign and domestic journals and congresses, as well as 24 expert-scientific medical books. He was the founder and first president of the Medical Academic Forum of the Medical Association of Academic Provenance, based in Belgrade, founded in 2002. He is active in politics, as he himself puts it from an early age, under the motto "if you do not turn on to politics, politics will turn on you". And after all he is teaching health policy for many years. He speaks several foreign languages, especially English and Russian. He is married to Marijana, and a father of two children: Uros and Iva.